There are many different brands of filing supplies, and when buying office supplies online, it’s difficult to know which brand gives you the best value for the money. Pictures of office products on the internet don’t always show the little differences of each item; many products look the same. This article is intended to take the mystery our of buying filing supplies online, and recommends the best brands to select for your office supplies needs. First we’ll look at the highest volume filing item, file folders. The truth is, all manufacturers make their folders using the same paper “tab” stock purchased from paper mills, and they all produce their folders using the same tab cuts like straight cut, 2/5’s cut, and the most popular 1/3 cut. This raises the question, does brand really matter when picking the right file folders. That answer is a resounding yes, if saving money and getting the best value is important to you. Smead is the most well known brand, and in my opinion has the highest quality products, especially when needing specialty folders like classification folders, expansion folders and medical office file folders. Universal, Globe Weis, Esselte, (and for recycled Earthwise), Ampad, SP Richards and S&J all make standard file folders that look and perform the same. So, it comes to a value difference, and my experience shows the best priced file folders are Universal brand. For lower cost, and good quality, Universal is my #1 choice. I avoid using the Big Box private brands like Office Depot or OfficeMax as they tend to be too flimsy even though pricing is ok.
Universal is my #1 recommended brand for good file folders at great prices! Many people feel that standard folders aren’t sturdy enough, and I actually agree. If that is the case, it’s not because you are buying the wrong brand of folder, it’s because you’re buying the wrong item. In other words, all manufacturers standard folders are basically the same, so if you want something thicker, buy their upgraded product offerings. While all manufacturers have standard lines, better lines and premium lines, Universal file folders tend to have the best overall price to quality value, sometimes with pricing 30% under more well known brands. When you want folders that have stronger tabs that last longer, look for “double ply” folders, or products sometimes called “reinforced tab”. These items are made with double strength tabs said to last twice as long as standard file folders, so well worth the higher price. If you want a heavier overall file folder, look for Heavyweight file folders. Heavyweight typically means the folder is made from 14 pt. tab stock which is significantly thicker than 11 pt. tab stock that most standard folders are made from. Sadly, many store private label folders today are even made using 9.5 point stock which isn’t much thicker than regular copy paper. 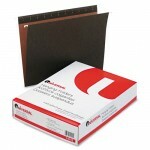 For both Double-Ply and Reinforced file folders, Universal has options in many tab cuts and both letter and legal size. 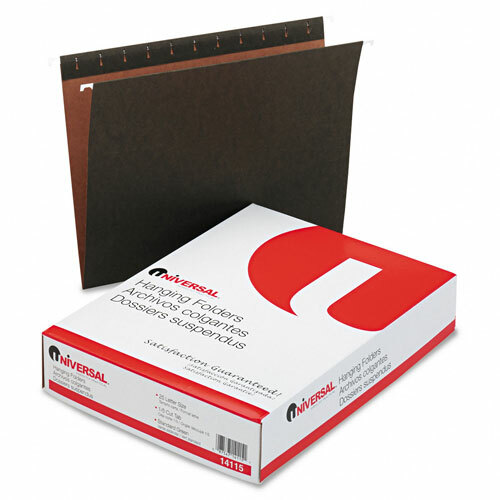 The next most popular filing supply item is hanging file folders. It would be easy to say that all hanging folders are the same too, and for the most part that is accurate. However one brand, Pendaflex brand by Esselte, has been making the best quality hanging folder for decades, and it really is a better quality folder. The Pendaflex brand name means the hanging folder is laminated, both on top where there is a lot of wear and tear, and in the middle where the crease is, right where you have the need for more durability. These folders cost more, but last at least twice as log if you plan to use your folders hard. For standard hanging folder needs, the brands are all basically the same, and again, Universal gives you the best value. 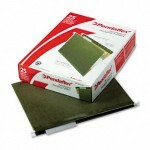 Pendaflex Reinforced Hanging Folders really are the best brand for durability. So when it comes to hanging folders, there are many brand choices from Globe Weis to American Pad & Paper, from Smead to SJ Paper, and from Universal to Pendaflex. If value is most important to you, choose Universal brand. If durability is most important, and you need your folders to be able to withstand continued pulling in and out of filing cabinets, then Esselte Pendaflex is the way to go. That leaves the question of where to buy filing supplies, and my answer is simple — anywhere but the large national chain stores. I stay away from Big Box corporate retailers, and buy all my office supplies online from an independent family owned company. There are many internet office supply companies today, and I have found one that practices conscious capitalism and gives back to the community by giving back to great charities. They do good work in the office, and for the community. So I feel good when I buy office supplies from them, and always know I’m getting the best value. Tristan is an office supply expert in Austin that love Zuma Office Supply! This entry was posted in Office Supplies Shopping Tips, Product Information and tagged Classification Folders, File Folders, hanging folders, office products, Office Supplies Online, Smead, Universal Hanging Folders. Bookmark the permalink. You can track the RSS feed for posts to the Office Supplies blog by clicking the RSS feed link for “Posts” on the home page of the blog. You can track comments for the blog there too under the RSS comments link. We do not have an RSS feed for the http://www.zumaoffice.com site. Thanks for your interest in Zuma Office Supply! Exactly where is the facebook like button ? If you go to the home page, http://www.zumaoffice.com, it is in the right column just under the block that has our toll free number, and the Ink and Toner Finder. You can click the Like Us on Facebook icon directly from there. Our Facebook page is http://www.facebook.com/zumaofficesupplies if you would like to “Like Us” there. The button is at the top of the page. Thanks for being a ZumaOffice.com fan! This is a problem I have to do more research into, appreciate the post. Office supplies and janitorial supplies are our specialty, but giving back to great charities is our true purpose at Zuma. Glad you like the post.